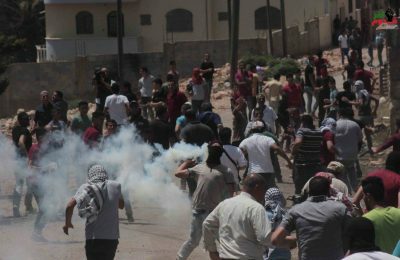 Israeli soldiers attacked, Friday, the weekly nonviolent procession in Kufur Qaddoum village, east of Qalqilia, in the northern part of the occupied West Bank, causing dozens to suffer the effects of teargas inhalation. 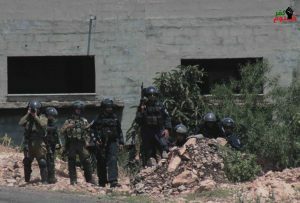 Morad Eshteiwy, the media coordinator of the Popular Committee against the Annexation Wall and Colonies in Kufur Qaddoum, said the soldiers resorted to the excessive use of force against the protesters, and fired dozens of gas bombs, and rubber-coated steel bullets at them. He added that dozens of Palestinians suffered the effects of teargas inhalation, and received the needed treatment by local medics. Eshteiwy stated that the procession this week also marked the 69th anniversary of the Palestinian Nakba, when Israel was established in the historic land of Palestine in 1948, after ethnically cleansing, depopulating and destroying hundreds of Palestinian villages and towns. Many protesters carried signs demanding Israel to implement the internationally-guaranteed Right of Return of the refugees.